The sonnets make up the first half of this slim volume of poems by Gail Thomas. In them, some of the symptoms of Alzheimer’s enable a daughter to reclaim her past and to make peace with this less than perfect present. At the same time, the illness dooms this mother to a vast forgetting—in Sonnet 8 the speaker reveals that the mother has not been told of the father’s death for weeks and must both grieve the father and grieve the mother’s inability to grieve. The interlocking sonnets act as small charms that embolden the speaker to both connect and to forgive, to retrieve and to process the stories of her experiences of a woman who was unavailable emotionally to both husband and children, exacting in her demands, silent to the point of dismissal of the “college smarty pants” (8) daughter-speaker of these sonnets. The past is painful, but the sonnet sequence itself seems able in Thomas’s adept hands to circle the past and to forage the present for signs of the relationship this mother and daughter might have had. This is felt keenly when the speaker asks in the final sonnet, “Did we find each other too late or just in time?” (8). Memory and generational connections tie the second half of the volume to the first. The poem “Alchemy” might very well explain the mysterious mother of the “Little Mommy Sonnets” a bit better, too, as the second-generation Italian-American mother, daughter of Italian immigrants, “…vowed to be modern / with recipes clipped from ladies magazines” (16), while the recipes of the speaker’s grandmother “bewitched us.” That eagerness and willingness for the mother (presumably the same mother from “The Little Mommy Sonnets”) to distance herself from an immigrant past might explain the mother’s emotional limitations in the first half of the book. But perhaps there will be more poems to explore this. The “new world” of modern America creeps in elsewhere in the volume in light and wise ways, as in the poem “A Five Year Old Creates Gender Theory” in which the speaker’s five-year-old granddaughter attempts to draw a line between male and female and is continuously stumped by the experiences of her elders, or in “Worker Man” in which a grandson’s penchant for playing with dump trucks aligns him with a great grandfather who “dropped out of school to raise his brothers / and sisters until the railroad took him,” eventually getting work through the WPA like so many immigrant men of that generation. In a few deft strokes, Thomas paints a picture of that man and his whole generation. Becoming a janitor later in life: “….Unasked, he planted / flowers in sidewalks. More each year / …. / Bill would call it / a day’s work, and work / with the right tools and clear purpose / is a revolution” (18-19). 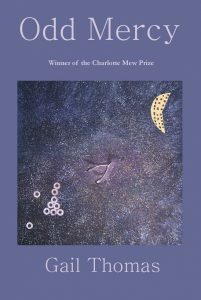 Odd Mercy won the Charlotte Mew Prize, selected by Ellen Bass. Julia Lisella is a critic and poet. Her poetry books include Always (2014), Terrain (2007), and Love SongHiroshima (2004). 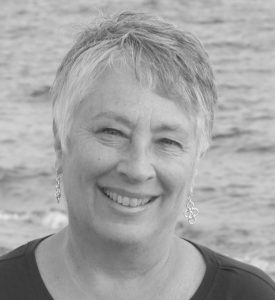 Her poems have been widely anthologized and appear in Alaska Quarterly Review, Ocean State Review, Valparaiso, Prairie Schooner, Crab Orchard Review, VIA: Voices in Italian Americana, Antiphon, Literary Mama, Pebble Lake Review and others. Her essays and reviews can be found at Women’s Review of Books, The Village Voice, MELUS, Italian American Review, and the essay collection Mama PhD from Rutgers Press. She is associate professor of English at Regis College in Weston, Massachusetts.